MLB pitcher who got his start with the Cleveland Indians in 2012. He became the team's closer and in 2016, he helped the team reach the World Series where they were defeated by the Chicago Cubs in game seven. He pitched for the High Point Panthers in college before playing with the AAA club the Columbus Clippers. Before being called up to the majors, he was named the Cleveland Indians' Minor League Pitcher of the Year. He became just the second player from High Point University to play at the major league level. He has a sister and a brother. He married Mallory Rundquist in November 2015. They welcomed their first child, a son named Carson, in June 2017. 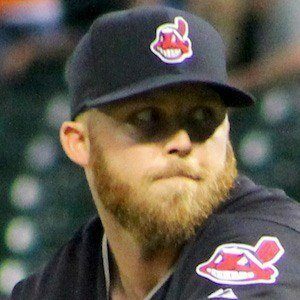 He replaced John Axford as the Indians' closer in May 2014.